This article is about the status effect from Mario & Luigi: Bowser's Inside Story. For the Vibe from Super Princess Peach, see Rage. Bowser under the fury effect. Fury is a status effect in Mario & Luigi: Bowser's Inside Story that can only be obtained by Bowser when he takes too much damage. While in the Fury status, Bowser flashes red, clenches his fists, and shows a much angrier facial expression with gritted fangs and puffs of smoke spewing overhead. In this state, the damage Bowser deals and takes is doubled, identical to a combination of both POW-Up and DEF-Down. 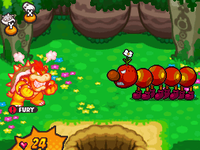 To cure this effect, Bowser can eat a Refreshing Herb, have a set amount of turns pass, or defeat all of the enemies on screen. Choombas go through a similar phase when fired up by Coalbits, making them deal more damage, move faster, and glow red. In the remake, Bowser also goes into this status effect when fighting him in Toadley Clinic, and as soon as he does he will fully heal himself (Bowser X does this too). Bowser with the Fury status in the remake. It is similar to the Great Force from Mario & Luigi: Superstar Saga and Mario & Luigi: Superstar Saga + Bowser's Minions, which doubles the damage the brother who is equipped with it deals and takes. In Mario & Luigi: Paper Jam, Mario & Luigi: Superstar Saga + Bowser's Minions and Mario & Luigi: Bowser's Inside Story + Bowser Jr.'s Journey, most of the bosses along with Princess Shroob in Mario & Luigi: Partners in Time automatically get this status whenever their HP is low enough. For the rest of the battle, they have more attacks, their POW and SPEED increase (alongside DEF in Mario & Luigi: Bowser's Inside Story + Bowser Jr.'s Journey), and some bosses will perform multiple attacks in a single turn. This page was last edited on April 10, 2019, at 12:10.